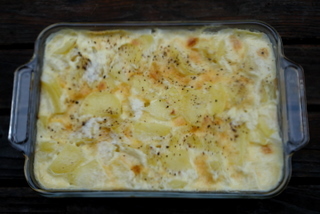 Gratin dauphinois is a typical dish from the French Alps made with thinly sliced potatoes baked in a sauce of milk, eggs, cream and garlic and topped with cheese. A bit of etymology. The Alps have a region called Dauphiné which includes 3 French counties: Isere, Hautes Alpes and Drome. The adjective derived from the Dauphiné region is called Dauphinois, such as the inhabitants or for the recipe at hand, the dish. 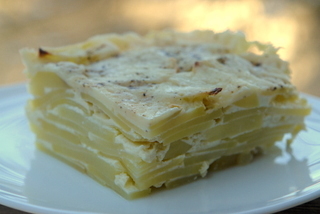 Gratin comes from the French verb “gratter” which means to scrape or grate (e.g. cheese or potatoes). 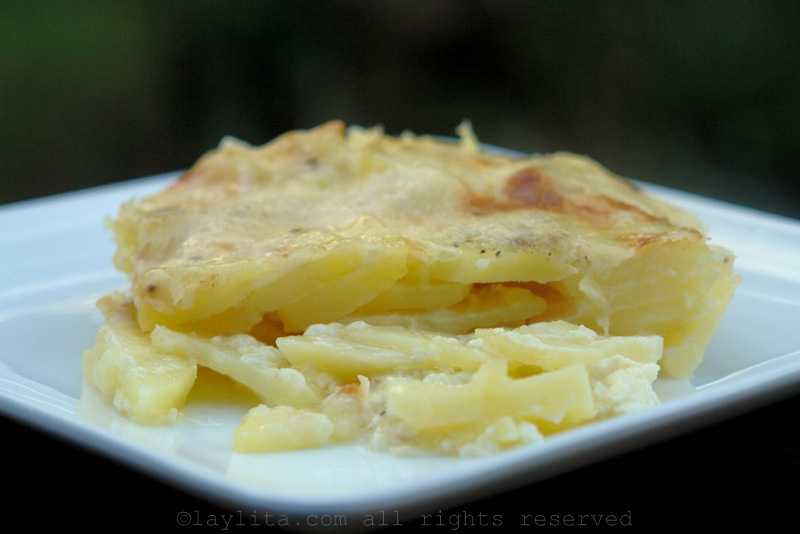 So its name and regional roots make the gratin dauphinois an excellent winter dish that is tasty, nutritious, and particularly appreciated in mild and cold months. It is a popular menu item in local restaurants in the Alps and a top pick from hikers and skiers to replenish their energy levels after a day on the mountains. 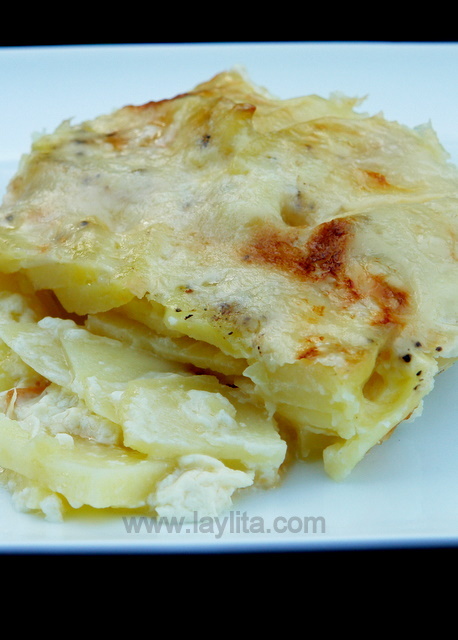 Recipe for potato gratin dauphinois, a traditional dish from the French Alps made with thinly sliced potatoes baked in a sauce of milk, eggs, cream and garlic and topped with cheese. 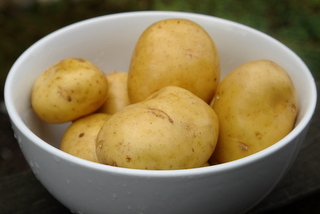 Peel the potatoes and rinse them in cold water. Then cut them so that each slice is about 2 inches long. Typically this involves one side slicing followed by a cut in half. The thickness of slices should be approximately equal to 2 to 3 coins (e.g. US quarters). 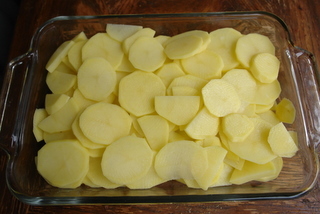 Place the potato slices in a 8 x 11.5 baking pan. Add the eggs, whipping cream, garlic cloves, salt and pepper in a blender. Blend a first time to dissolve the garlic into the mix. 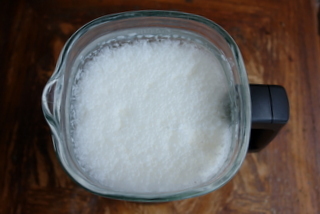 Next, add the milk and blend again for a few seconds. Pour the blended mix over the potatoes until they are 95% covered. 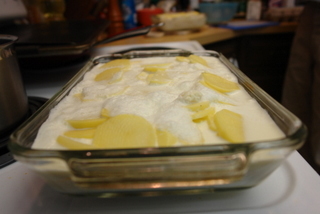 Given the gratin preparation is going to boil inside the oven, make sure the level is not too high to overflow once in boiling state. Generally, such level is at about 80% of the mold's height. Place the dish in the pre-heated oven at the middle level of the oven. Let it bake at 400F for the first 30 minutes so that potatoes cook effectively and become tender. 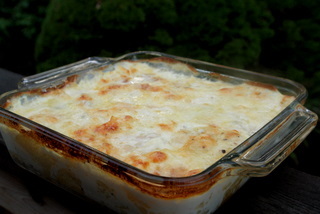 Once the 30 minutes have passed, take the gratin out of the oven and layer the cheese uniformly to cover the top surface, then put it back 15 more minutes to let it melt and slightly brown. 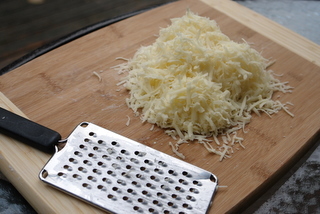 ***Tip: before adding the cheese, you might see that a little bit of water has developed from the baking process. Take the gratin over a sink and gently (very gently!) incline it to remove some of the liquid. Inclining too much, you can lose the dish in the sink. No need to remove to all the water as the potatoes will absorb it back as they cool down, but taking some of it out does help make the dish more firm. I spent several years of my childhood in the French Alps in a town called Saint Jean de Maurienne, in the county of Savoie. It is nested between mountains in the middle of a valley crossed by the Arc river. The town is known for its traditional industries such as old style knives (“Opinel”), tourism as a hub for skiing and mountain activities, as well as a fast route to Italy, now less than 90 minutes away using the new highway that takes drivers straight through a long tunnel underneath the Alps, and into Italy (“le tunnel du Frejus”). During these years, I lived with my Grandma who herself was born in Sicily and had spent most of her life near Saint Jean, in France. For several years she had a mountain restaurant in a very tiny village called Albiez, right above Saint Jean. The mountains carry spectacular views. The climate is continental, which means that summers are hot and winters very cold with lots of snow. Food is inherently tied to people’s customs, the ingredients available, and of course, influenced by the climate. Back to my Grandmother Ernestine, she made this dish while having her restaurants and later on at home after she retired. I can remember the smell of potato gratin baking in the oven when I was 9 or 10 years old. Coming back from school and opening the apartment’s door always carried a hint of the meal to come. I knew what she was up to, and it felt what we experience when entering a homy environment when someone is cooking for the family. Tasting the dish for many years and observing her, I grew a taste for gratins and have come to cook it myself over the years, now that we have our own kids and family to feed. 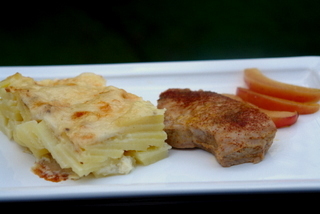 Great companions for a gratin include red or white meat dishes, such as chicken or daube. 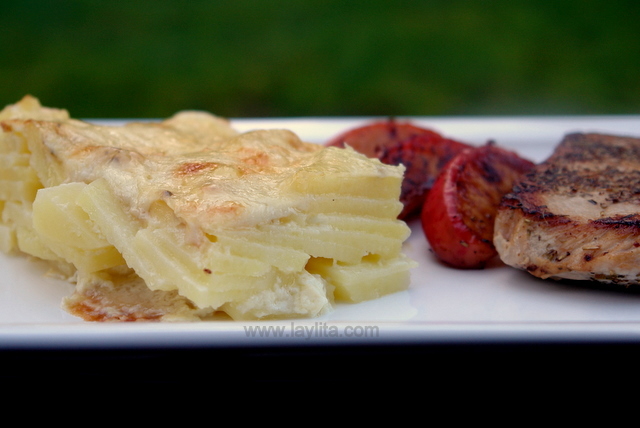 This easy to make potato gratin is also a great option for a vegetarian meal. Pair it with a green salad for appetizer and a glass of medium to full bodied red wine and you’ll have a great menu. THIS WERE SOOOOOOOOOO GOOOOOOOOOOOOD!!!!!!!!!!!! Thank you!!! Are you still writing this website? I just found you and I’m so thrilled. I’ve traveled a couple of time to Ecuador and have not made it to Lojos but I LOVE the country! ;) I hope you are still writing somewhere if not here. 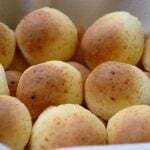 I’m hosting some friends from Guayaquil this weekend and was looking for some special recipes. Thanks! What fantastic photos you take! My mouth is literally watering and my mind is running. Thank you for the great inspiration. Cheers! you guys are the best duo!! Thank you for such a wonderful recipe. It looks delicious. I was worried, since I had not heard from you. Glad you are back. Hi Nico! Good to have you blogging too! Laylita, I have wondered about you since I did not see you post for a while… good to have you back! Hey Laylita! You are back, thanks! Have a great year!!! Happy New Year!! Thank you for such a wonderful website. I’m Ecuadorian and growing up I always watched my Mama cook such wonderful and dilicious dishes…one of them, my favorite, caldo de bolas. I always wanted to try making this dish but didn’t quite remember, never really had the exact recipe. She never used recipes, it was all in her head..she was a great cook!! Yours has come so close to hers…I made it the other day and my family loved it. Making it brought me such wonderful memories of when i was only a liitle girl helping her make this dish…my Mama has been gone now for 19 years. Yeay! you’re back! 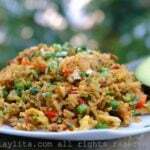 I made chaulafan for my daughters birthday – success (my ecuadorian inlaws and extended family very impressed)! and now my vegetarian mother is coming on saturday I will definately be making the gratin for her, this site has been a life saver – thank-you! Woohoo! You’re back! I’m mesmerised by the potato slices – so exact! Very nice, hearty recipe for a winter’s day. Hey Laylita! You are back, thanks! and Nico’s recipe looks wonderful, I am cooking today the chaulafan..